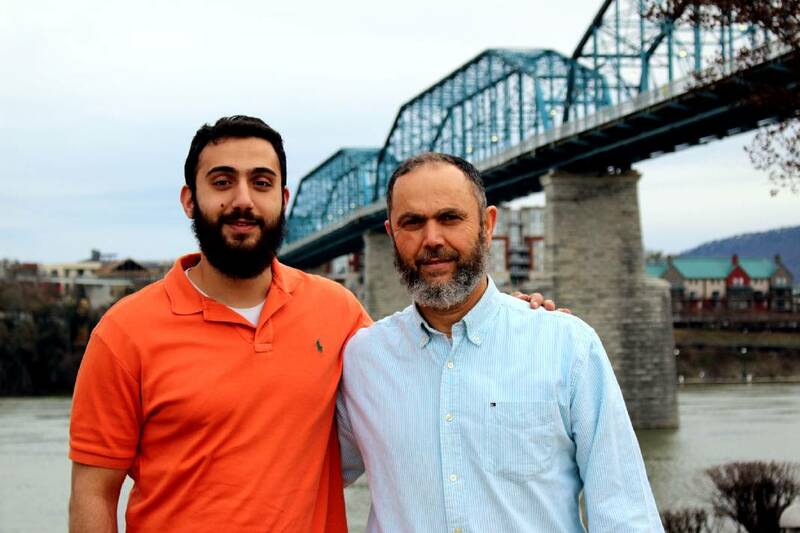 Mohammad Youssef Abdulazeez smiles with his father, Youssef, on the Walnut Street Bridge in a photo taken earlier this year. This story was updated at 11:28 a.m. with a new photo and new information about the gunman's online activity as it related to a militant Islamic cleric. The windy road to Mohammad Youssef Abdulazeez's Hixson home is peppered with churches and subdivisions. In Colonial Shores, where Abdulazeez once played with the neighborhood children, American flags hang above neatly manicured gardens. It's the kind of place where teenage boys get paid cash to run lawnmowers in the heat and retirees wave at drivers while they tend to their tomatoes. And, by all accounts, Abdulazeez and his family fit in here. They smiled. They were friendly, neighbors say. Youssef Abdulazeez was a soil engineer for the City of Chattanooga. His only son and four daughters were bright and handsome; two had engineering degrees and another was working on her masters. Rasmia Abdulazeez, who has a soft, round face in pictures, was like most mothers, celebrating her children on Facebook. When Abdulazeez graduated from the University of Tennessee at Chattanooga she posted a picture of him in a cap and gown and wrote a blessing. Friends ogled over her recently married daughter, Deena, who had a Palestinian-themed wedding but wore a mermaid-cut wedding dress that showed her slender figure. In the spring, they hired a friend of the family to take portraits in Coolidge Park. In one picture, the siblings lay on the grass, their heads pressed together, their mouths agape from laughing. In another, they make funny faces, sticking out their tongues, rolling their eyes. But the family had secrets. The son had secrets. For years, according to a family spokesperson, the clean-cut only son — the wrestler and mixed martial arts fighter who friends and acquaintances say was funny and loyal and competitive, the jester who made fun of his Middle Eastern name in the Red Bank High School yearbook — felt depressed. The family, which is of Jordanian descent, took Abdulazeez, who was born in Kuwait, to a child psychiatrist when he was in his early teens. He was placed on medication, but the depression never lifted. Then, when he was 19, his mother filed to divorce his father. In the complaint, she said Youssef beat her in front of the children and sexually assaulted her. She also said that he told her he wanted to take a second wife, which is permitted under Islamic law. Both of Rasmia's brothers flew to Chattanooga from Washington, D.C., and Kuwait, to help the couple reconcile, which they eventually did. An agreement was signed between the two, in which Youssef promised to attend counseling, give her an allowance on the fourth day of every month, and spend an hour every night with her discussing family issues, like when a child was disrespectful. While the family instability may not have worsened Abdulazeez's mental state, it didn't help it either, said a person close to the family who didn't want to be identified. The depression persisted, intermixed with states of manic. By the time he was in high school, Abdulazeez was already using marijuana and alcohol to self medicate. Several years ago, when the family recognized a serious addiction, the family spokesperson said Abdulazeez's parents tried to intervene and send him to rehab. His most recent trip to Jordan was to see his uncle and grandfather who were supposed to help distance him from "bad influences" at home. "The hope was that the supervision would help him get back to his best self," the family spokesperson said. Still, his dependency worsened. The drug use would eventually lead to his job loss in Ohio in 2013. He failed a drug test at FirstEnergy Nuclear Power after working there for just 10 days. For months, he lived in Ohio without a job and only told his parents that he had been let go when he ran out of money. The failure left him deeply embarrassed and ashamed, the family spokesperson said. He wasn't seeing a counselor, but he did see a psychiatrist periodically. Yet didn't take his medication regularly. It was during this time that he started to scribble notes to himself. On loose leaf paper, he wrote about his suicidal thoughts and expressed admiration for anti-American extremists. Later he would tell family members that he was deeply in debt and considering bankruptcy. Then, in April, a month after the happy family portraits in Coolidge Park, he was pulled over by police because he was driving in and out of lanes, speeding and then slowing down, stopping at green lights. In the incident report, the police officer wrote that he smelled like alcohol and burnt marijuana. His eyelids were droopy and white powder was on his nose, which he told the officer was crushed caffeine pills he had snorted. Some friends say he was changed when he returned from Jordan in 2014. When he came home to see his family during Ramadan, he went to mosque. He fasted and prayed. He grew his beard long. In two blog posts written three days before he killed five military service members —Navy Petty Officer 2nd Class Randall Smith and U.S. Marines Carson Holmquist, Thomas Sullivan, Skip Wells and David Wyatt — and wounded several others before being shot dead by police, he seemed to have found clarity. He wrote that some people thought that the Sahaba, the companions of Muhammad, were priests "living in monasteries" but that that wasn't true. "Everyone one of them fought Jihad for the sake of Allah. Everyone one of them had to make sacrifices in their lives." By this time, he was taking sleeping pills to help him rest for his late night 12-hour shift at his job and painkillers for a back injury. He mixed those with opiates, marijuana and alcohol, the family representative said. His July 30 court date was quickly approaching, and some family members had just learned of the charges. Online he Googled about martyrdom, wondering if he could be absolved of his sins through martyrdom, the family spokesperson said. In 2013 He followed videos of Anwar al-Awlaki, an Al Qaeda cleric who is popular among jihadists, and did research for Islamic guidance on committing violence, according to an ABC News report. He had guns at his family's home. A family spokesperson said his parents had asked him to give them up, but he used them for target shooting and hunting. On July 11, he bought ammunition at the Hixson Wal-Mart. Then last Tuesday morning, the 24-year-old left home. He rented a silver Mustang and told his parents he would be gone for a work trip. But instead he went on a drug and alcohol bender, driving the Mustang with friends, at times as fast as 100 mph, the spokesperson said friends have told the FBI. It seems the shame he tried to escape, he left with them. Contact staff writer Joan Garrett McClane at 423-757-6601. Contact staff writer Joy Lukachick Smith at 423-757-6659.